Have I reached the wrong place? No. Unless you were searching for something else on the Internet that, er, we don’t offer, and somehow ended up here. I mean, what’s this massive machine? 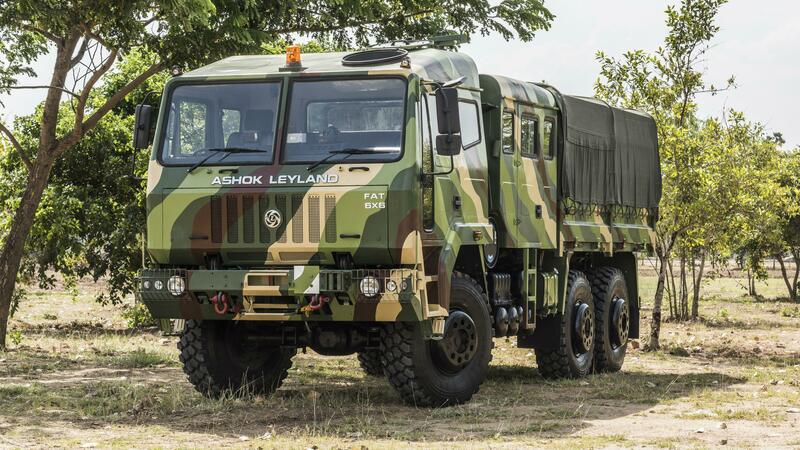 This massive machine is Ashok Leyland’s Super Stallion FAT (Field Artillery Tractor) 6x6. It may seem so. But the name is rather self-explanatory. It’s a towing vehicle for artillery with 6x6 traction. Artillery in this case meaning weapons like the Bofors gun. Heavy. But must be a beast of an engine. Literally. Six litres, six cylinders, 450 horsepower. In hindsight, you are right. A Grand Cherokee SRT has a bigger engine and makes more horses. So what’s so beastly in the engine? The torque. The FAT 6x6 makes 1400Nm of it. Wow. That’s a lot of pulling power. That’s not all. It makes this 1400Nm of pulling power with the engine spinning at just 1300rpm. We bet you aren’t going to get a passenger car that makes more power or torque than its engine revolutions. It does. But ‘scorcher’ here is quite not the ‘scorcher’ you expect it. Don’t expect 0-100 times. The FAT 6x6 runs out of breath at 90kph. But speed is not the ware the gun carrier peddles. Isn’t it useful to get around the battlefield, er, fast? Not as much as getting around as such. But what all it can get around and over of. You mean, like different terrain? Of course. And boy, can this thing tackle terrain. In fact, not only terrain. It can withstand a lot of torture. Oh, is it bullet proof? No it doesn’t need to be. The FAT 6x6 doesn’t actually have to get into the line of fire. It’s a carrier for long range guns. So it mostly sees duty besides the gun as they fire into the distance. But the challenge is always getting the gun to the strategic spot which may involve climbing something steep, fording something deep, or just going over terrain the limbed wouldn’t walk over. So, can the FAT 6x6 tackle terrain? Oh, you bet. In fact, we did not know terrain like this existed before we tackled them in this military monster. Firstly, Leyland’s research and development centre has a variety of torture tracks… surfaces that thoroughly wring the suspension inside out. There are massive rumblers, boulders, potholes, and the one surface that will leave your bones rattling even after you are done tackling it. What Leyland calls a pave way. Think of it as a cobbled-stoned street multiplied by 50. All Leyland vehicles go through this intense torture test for 24 hours at a stretch. Drivers take 45 minutes shifts each. Is the pave way that tough? I was inside the truck for about 15 minutes for photos and by the time I got out, 15 felt like 50 minutes and I had a quick check if my bones will still where they were supposed to be. This little shake-up or shake-down rather was like being inside a consistent earthquake. What are its other talents? The FAT 6x6 can climb up a 25 degree incline. Now, I have been on rather steep off-road jaunts. Even if not on such steep ones. Yet, I am familiar with the feeling of having all of my food at the back of my intestines as I drive up something steep and have that unnerving sight of nothing-but-sky out of my windshield. But despite all off-road tech available to modern passenger cars, one thing was unavoidable. That’s right. I’d always have to reverse a distance and build up some speed before having any hope of making it up and over. So even the FAT 6x6 would need some? Oh no. The FAT groans its way to the foot of the incline, comes to a complete halt, and on an incline so steep that humans can’t walk up or down without support, this machine roars its way up like a Tata Nano goes up the ramp of a multi-storey car park. It needs to be in the lowest gear, and makes some noises when grunting up, but the 6x6 goes up in one clean move. It goes around and does the climb again. Again. And again. How right you are. I repeat. 1400Nm at 1300rpm-1500rpm, in case you missed it. As I don’t have a commercial vehicle license I wasn’t entrusted with challenges like negotiating inclines, tackling torture tracks and driving over surfaces that test the articulation of this beast that stands a good 400mm off the ground. But I did drive it over a normal surface. Putting it in first was an issue at first. I used to shove the gear stick with maximum force. But just figured all it needed was a firm, short push. As the six-cylinder engine redlined at a mere 2500rpm, it meant quick gear changes for quick progress. It was only by sixth gear in that nine-speed manual gearbox that I could feel the vehicle making any swift progress. In Army duties, I reckon this Stallion will mostly be sticking to the first four gears. Shifting gears in this thing wasn’t exactly a breeze. I am not in a position to comment on heavy vehicle ergonomics, but with all the even gear ratios, second, fourth, sixth… your arm does have to reach out to the rear to get a firm grip for that firm shove. The steering is is light and makes the vehicle easy to manoeuvre around curves. Does it handle and brake well? Braking takes some getting used to. If you are gentle, the behemoth takes a while to shave off speed. If you stomp on the brakes, this juggernaut comes to an immediate, unnerving halt. Surely, being smooth with this thing takes some practise. Reversing isn’t much of a problem thanks to a reverse camera. In fact, you can’t exactly call it a reverse cam as it’s primarily meant for the driver to load, unload and tow the gun at the rear. Besides, the reverse screen doesn’t get activated when you engage reverse gear. It remains on permanently. Wow a reversing cam. Any other comfort features? Noisy, but powerful air-conditioning with intense heating and cooling. The FAT 6x6 is, after all, designed to operate at -40 deg to 55 deg Celsius. What about the tyres? They are usually the weak link in a tough vehicle. In the FAT 6x6, the tyres are tougher than the vehicle itself. It has a centralised tyre inflation and deflation system. The driver can increase and reduce the tyre pressure from inside the cabin depending on the terrain the FAT 6x6 needs to tackle. Besides, the tyres – all six of the obviously – are locked to the rim. So even if there’s a severe puncture that takes the tyres to zero psi, the rubber remains on the rim ensuring the 6x6 never has to scrape the terrain with its wheels and the driver retains better control of the entire vehicle. Quite. Rather than a war machine that destructs, the Super Stallion is a machine that protects and endures. For something this side of a tank, it can take quite a beating.